Widow’s Christian Place: How Can Anything Be Good About A Monday? How Can Anything Be Good About A Monday? Do you ever meet Monday with a groan? During grief every day, every hour, every minute is a groan. We're grateful just to breathe. As you go along, though, the groans begin to let up. I hope you'll join me in capturing the moments and times of relief by marking them down and collecting them like a hobby. Some people collect coins, or stamps or Precious Moments figurines, but I collect blessings and I hope you will too. A couple days ago I added a note from a reader to my collection. With her permission, I thought you'd like to see what she emailed me. Why not join us today by starting your own 2014 jar of good memories. (Click here for the how-to). Hi, Here is a picture of my "good things" jar. 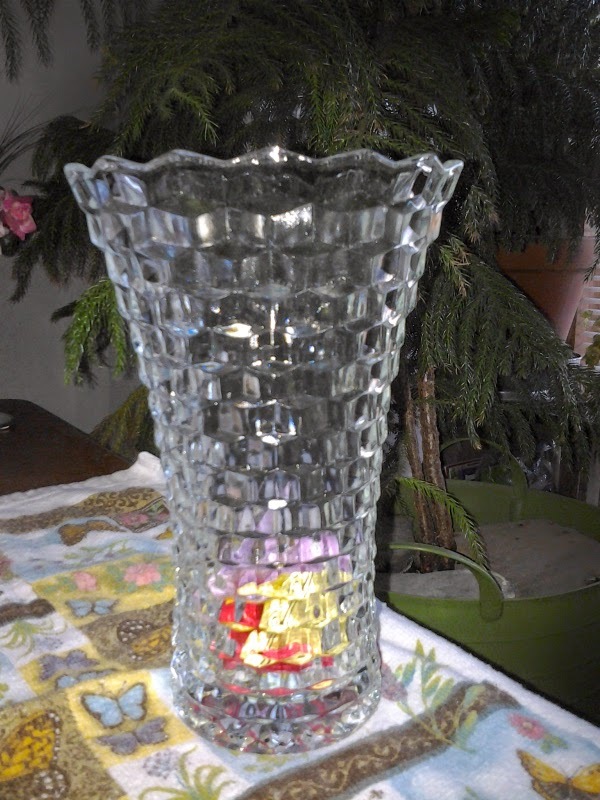 It is actually a vase that I love but hardly ever used. I am using different brightly colored slips of paper, so when it is filled, I will have a colorful "bouquet" to remind me of blessings through the year! Thank you for the idea! Ps...Your blog is one of my blessings! Last week I took a breather from blogging to let my lower back begin to heal from a number of abuses I've inflicted on it this spring with pathetic attempts at gardening, etc. I'm not back to freedom yet, so the blog this week will get a lot of help from friends like you. For me, that's a good thing about Monday and I'm adding that to my jar. (Much better than jelly ☺). I wonder, though, what's a good thing about today for you? My blessing for Monday....God has given me a job that I truly do love and a team of people with which to work who are a delight to work with and for! After having worked for myself for the past 15 years, it's truly a joy to find an office with coworkers such as these. I have no doubt it is a gift from my Heavenly Father! He is so gracious and compassionate! I'm praising the Lord with you for the blessing of a job you love! Thanks for sharing! Super blessing, Beth! I know you must have been so thrilled! Next time he calls please tell him I can't thank him and his unit enough for serving and protecting our country. And deep thanks to you, too, because I know its a sacrifice for you military moms too. My Monday blessing ~ being with our local Christian widows group, Friends Needing Friends. I found this group a little over a year ago, a coupls of months after losing my dear husband and it has been a tremendous blessing in my life. Today I tackled things I really don't like to do such as balancing my check book and cleaning fallen branches from my front yard. I am thankful that the Lord gave me the ability to do those things. I love this idea, Ferree! I need to do something similar to have a visual reminder of my many blessings. Going through a challenging season as I reached the fifth anniversary of Buck's home-going yesterday. This journey still has its valleys, but it is also packed with many "good things". Thanks for all you do for us. I pray you will be restored soon and feeling like yourself again. Hugs to you, dear lady. In 1998 I bought a little desk calendar meditation 'book" which can be flipped over each new day. The title is Celebrate Today. Each page has a meditation and also a funny quip for that day. Some pages are full of my notes of the day's celebration throughout the years, while others remain open for a comment. Because this revolving calendar is not limited by a certain year, it is in continuous use and I write in pencil. As I turn to a new day's page, I am reminded of the past celebrations that occurred on that particular day. I wrote the following note to myself on its dedication page the day I brought it home, "I believe every day has a moment within it to celebrate its joy - allow yourself to be open for its reveal". I have never regretted buying this little gift for myself as it reminds me of life's celebrations during good times as well as the bad times. That's a fantastic idea, Sheila, makes me want to find one for myself. Do you have a picture of it, or something like it available in stores today? The calendars I've seen aren't reusable like that, but I'd love to try it. If we're not open to joy, we might not recognize it when it comes along. You've developed a real treasure with your calendar of celebrations.